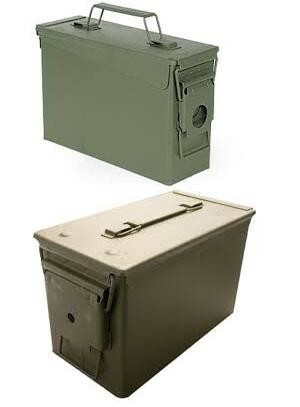 These New .30 cal and .50 cal Ammo cans are the same cans that are being used by U.S. and NATO forces around the globe. They have hundreds of uses around the home, shop or range. The sturdy steel construction and waterproof seals ensure that these cans will keep the contents safe and dry for many years. .30 cal Can - Length: 10" Height: 7" Width: 3.5"
.50 cal Can - Length: 11" Height: 7" Width: 5.5"
*Additional freight charges may apply when ordering 4 or more cans. You pay actual Shipping and Handling and shopping cart estimate is void on this receipt. Actual shipping will be calculated from our zip code to yours through FED EX Ground.